Welcome to the Transcranial Direct Current Stimulation FAQ page! 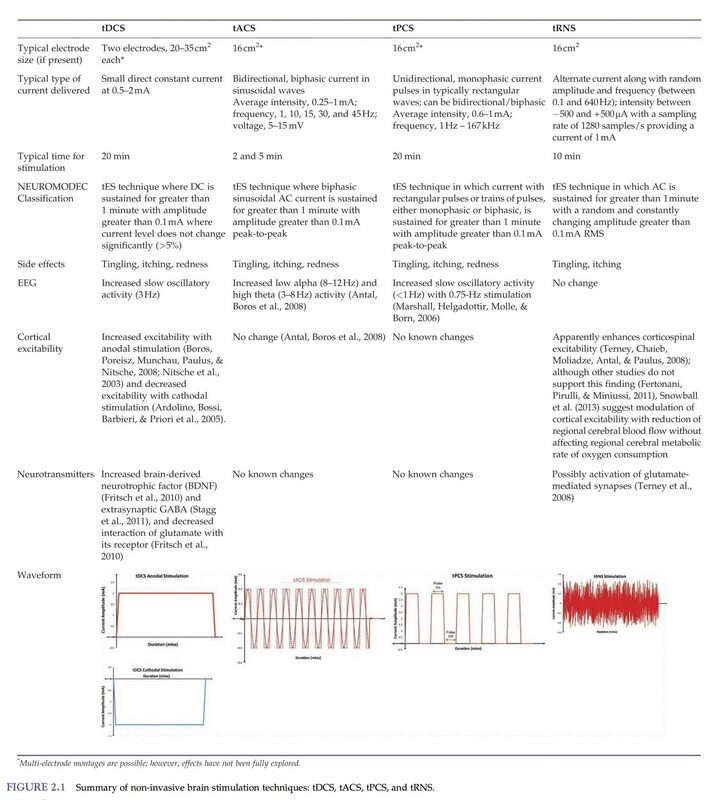 Compiled here are the questions most frequently presented to us by those interested in tDCS. We’ve tried our best to answer each question in a straightforward, yet comprehensive manner. We are continuously adding more questions, and updating our answers, to ensure this FAQ contains the most relevant up-to-date information as possible. Can’t find what you’re looking for in our tDCS FAQ? Just submit your question using the form at the bottom of this page and we’ll try to answer it to the best of our ability. If your question is a good one, we may add it to this page and even give you credit! However, if you need an immediate answer to your question, we still suggest sending us a message. tDCS is so confusing… Where do I start?? Not to worry, we’ve got your back! While tDCS can be confusing at first, it’s really fairly simple and straight forward. First and foremost, we recommend that anyone interested in tDCS read through this FAQ page. We spent a significant amount of time researching and compiling these Q&A’s in hopes that it helps individuals like yourself in your quest to learn more about tDCS. We are always looking to improve this FAQ, so if you can’t find the answer to your question, please submit it at the bottom of this page! Secondly, you may want to take a look at our “What is tDCS?” page. While you may find some of the information redundant, we’ve attempted to present information on tDCS in a more straight forward and easy to understand manner. If you’re looking for information on electrode placements, try TotaltDCS.com. This should help get you well on your way to understanding more about tDCS. Is The Brain Stimulator like the Halo Sport? YES! Our products use the same technology (transcranial direct current stimulation) as the Halo Sport headphones. The only difference between The Brain Stimulator and Halo Sport (other than price), is The Brain Stimulator provides the user with the flexibility to position the electrodes in multiple arrangements. The incredible thing about tDCS is that different electrode placements (referred to as “montages”) can produce different results. The Halo Sport headphones utilize fixed electrodes, which are located on the headphone’s bar, placing them directly over the primary motor cortex. While this may be convenient for those who wish to use tDCS for solely for muscle memory, this limits the user them from exploring other placement positions. We took a different approach and manufactured The Brain Stimulator with free standing electrodes which can be placed anywhere the user desires. From the very beginning, we have always maintained the belief that the customer should be allowed to use tDCS in any manner they so choose and that to limit the customer would be to limit self exploration and creativity. General consensus suggests that standard tDCS sessions can last anywhere between 5 to 30 minutes, with the most common professional research sessions lasting 20 or 30 minutes in duration. Clinical research has found five minutes to be the minimum stimulation duration required to produce notable effects which last beyond the conclusion of the session, and that sessions lasting 20 to 30 minutes often produce the best results1. Why don’t your tDCS devices feature a meter? Our goal is to produce tDCS devices of the highest quality standards, which operate with precision and guaranteed accuracy, therefore we do not include current meters in our products. Analog current meters are incredibly inefficient, and are only required for tDCS devices which do not have proper voltage/current control and adaptation circuitry in place. The Brain Stimulator tDCS devices include enhanced circuitry comprised of precision components, integrated circuits, and microprocessors (“smart” technology) which control and monitor current and voltage levels several times a milliseconds. Through the use of these special technologies, and by nature of design, our products do not require the user to monitor current flow. However, tDCS devices which use rudimentary circuitry must include a current meter, as the user must constantly monitor and adjust the output flow in order for the device to produce accurate current. In some ways this can be compared to manual (stick shift) cars versus automatic cars. With a manual gear shift automobile, the drive must constantly monitor the state of the automobile to know when he or she needs to change gears (adjust the device). However, cars which utilize automatic shifting do not require the constant attention of the driver as the technology within the car “adjusts” (shifts) itself at the optimal time. What is Saline Solution and how do I make it? Saline solution refers to the mixture of NaCl sodium chloride, aka salt, and water. Saline solution is commonly used in medicine to cleanse wounds, treat dehydration, and cleanse and preserve contact lenses. Non-invasive brain stimulation techniques like transcranial direct current stimulation (tDCS) utilize sponge electrodes to apply current to targeted brain regions. Sponges are used because when wetted they allow current to flow through any hair located on the head. Since water by itself isn’t a great conductor of electricity, it is best to use a saline solution to ensure that current reaches the cranium with the least amount of resistance. Saline solution can easily be made at home using tap water and standard table salt. The optimal concentration of salt for use with transcranial stimulation is 0.9%. This equates to approximately 2.3 grams of salt per a standard 8oz glass of water. For convenience, we sell a Saline Solution Applicator Bottle which includes accurate mixing instructions printed right on the bottle. This 2oz pointed-spout squeeze bottle makes it incredibly easy to apply saline solution directly, and evenly across the sponge electrodes. Furthermore, the liquid seal cap means you can travel with your saline solution, even while flying as it complies with all TSA travel guidelines! The Saline Solution Applicator Bottle comes included with every Deluxe tDCS Kit, or can be purchased individually through our online store. Do I need to use saline solution, or can I use plain water with my sponges? While saline solution is not strictly required for use with sponge electrodes, it is recommended. Plain water will work in helping the sponge to pass current, just not as well as saline solution. Water in and of itself is a very poor conductor of current. So in using just water, you’re essentially asking the sponge alone to work to pass current to the targeted area. By adding salt to plain water (saline solution), the electricity is able to actually jump from molecule to molecule through the solution, providing a better connection. In using a sponge well soaked with saline solution, the current encounters the least amount of resistance, providing the most effective, and most comfortable tDCS experience. How often should I replace the sponges in my tDCS electrode? tDCS electrode sponges can be replaced every two weeks or after seven tDCS sessions. However, for optimum performance and hygiene reasons, we recommend replacing your sponges after each session. Replacement sponges for 2×2 and 3×3″ electrodes can be purchased in packs of 10 in our online store. In addition, due to customer requests we now offer replacement sponges in subscription plans at discounted pricing. More importantly, if your tDCS sessions become uncomfortable, or you start to notice sensations that maybe you didn’t before, this is a good sign that your sponges need replacing. You can find 10-packs of replacement sponge inserts for both the 3×3″ Amrex Electrodes and the 2×2″ Amrex Electrodes in our online store. What are the differences between the 2×2″ and 3×3″ Sponge Electrodes? Essentially the main difference between the 3×3″ Sponge Electrodes and the 2×2″ Sponge Electrodes is the size of the electrode pad and the area they cover. They both are constructed in exactly the same way, with the same materials and use the same Amrex electrode cables and adapters. The 3×3″ electrodes will cover a broader area, while the 2×2″ will cover a slightly smaller, more condensed area. Essentially the 2×2″ sponge electrodes will stimulate a more targeted area, while the 3×3″ have more of a generalized effect on the area being stimulated. Additionally, because of the larger surface area, the 3×3″ size generally provides a more comfortable session with fewer negative side effects. Due to these facts, the 3×3″ size sponge electrodes are far more popular than their 2×2″ counterpart. What type of 9V Battery should I use with tDCS? Can I use a rechargeable batteries? We recommend using Alkaline disposable 9V batteries for use in our tDCS devices. Alkaline 9V batteries are the standard, over-the-counter batteries which can be purchased at almost any store that carries batteries. Common brands include Duracell, Energizer, Rayovac and others. Out of the various brands of Alkaline 9V batteries available, we personally recommend Duracell’s Procell brand Alkaline 9V Batteries. This is the only battery that we personally use, and the only battery that we stock in our online store. There are several different factors why we recommend this type and brand of battery such as longevity, reliability, power, and affordability. More information on Duracell Procell 9V batteries can be found on the product’s listing page. Regardless of the brand of battery you choose, we strongly recommend not using rechargeable batteries for tDCS. One reason for this is that these batteries are rarely charge to the full 9-volts, which prevents the user from effectively engaging in tDCS montages where electrodes are father apart. Essentially, the higher the voltage, the more effective the battery is at passing current over farther distances. I’m not feeling anything… Am I using my Brain Simulator right? It’s actually fairly common for individuals using well soaked sponge electrodes to not feel much of anything when engaging in tDCS. Sometimes you may notice a sensation when first turning on the device, which may fade away over the course of the session. This is due to the cells in your body aligning to allow the current to pass through with less resistance. Additionally, we’ve found that over time the body becomes less sensitive to the feelings associated with tDCS. If you’ve been using tDCS for some time and no longer feel anything, even when replacing the battery, it’s very possible that you’ve just become used to the sensations. We can assure you that there is little to no possibility that your device has “gone bad” as we have individuals who have been using our products for years and still experience all of the wonderful effects that can be associated with tDCS. If you’re still suspicious that maybe your device isn’t producing current, there’s a simple way that you can test to ensure current is flowing. Install a new battery in your device and remove any electrodes or adapters from the electrode lead wires. While this next part may sound a little weird, it’s completely harmless. Turn the device on and to the lowest setting, and lightly lick the two electrode leads with your tongue. You should feel a slight tingle on your tongue (less than the sensation of licking a 9 volt battery, if you ever did that as a kid). I experienced a flash of light when using tDCS. Is this harmful? These flashes of light are quite common when using transcranial electrical stimulation, and are known as phosphenes. Usually this will happen when an electrode is placed near the eye, and is a result of current running across optic nerves. While it may seem scary at first, this phenomenon has been recognized and studied by the scientific community and is understood to be a harmless side-effect of tDCS. Phosphenes can be reduced or even prevented completely by moving the electrodes further away from the eyes. More can be read about TES and Phosphenes in this PubMed Article. 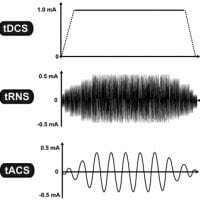 What Frequency or Hertz do your tDCS devices produce? The technology in our devices actually doesn’t utilize Frequency. Frequency is the number of occurrences of a repeating event, within a specified unit of time. Hertz is a unit of Frequency used in the International System of Units to represent one cycle per second. Hertz is often used to measure Alternating Current. In the field of Cranial Electrical Stimulation, Alternating Current is used in tACS devices (Transcranial Alternating Current Stimulation). Devices such as ours that utilize tDCS (Transcranial Direct Current Stimulation) utilize Direct Current, which is essentially the opposite of Alternating Current, in that it doesn’t oscillate (or repeat) and remains consistent. What are some other forms of transcranial stimulation? tCS, tACS, tRNS, TENS, CES, TMS & ETC Defined. The acronyms tCS and tES (often used interchangeably) are used to describe any therapy in which electricity is applied on or through the cranium. In comparison to all of the types of cranial stimulation listed below, it is generally understood by most that tDCS is safer, more comfortable, easier to engage in, more affordable, and will often produce a more robust response. However it is important to note that new theories and opinions on the different forms of tCS/tES are being developed on an ongoing basis. During tACS, very low levels of alternating current are applied to the brain, usually via a set of non-invasive electrodes placed on the head. Alternating current is different from direct current in that electrical current periodically reverses direction, taking the graphical form of a sinusoidal shape. Amplitude, frequency and relative phases across stimulation electrodes can be controlled. 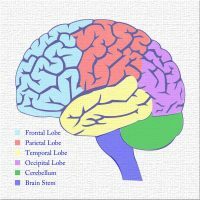 tACS and it’s effect on the brain is currently the subject of an active research field in basic and clinical Neuroscience. A new form of transcranial electrical stimulation, first tested in 2008 at a public research University in Göttingen, Germany. Like tACS, tRNS uses oscillating current, with the distinction being tRNS utilizes random amplitude and frequency. While this stimulation method is still very new, it is hypothesized that tRNS’s effects are mainly excitatory, and that higher frequencies may produce greater results. Usually used in muscle therapy and not intended for use on the cranium. Transcutaneous is defined as existing, applied, or measure across the depth of the skin. Applies a small, pulsed (AC) electric current across a patient’s head to treat anxiety, depression, insomnia and chronic pain. The term CES is often used interchangeably with tACS to refer to the same type of device. Utilizes magnetic fields to stimulate nerve cells in the brain, and is usually used to treat depression in patients where other therapies have proven ineffective. TMS can be very particular and should only be performed by a qualified technician. To learn more about TMS and rTMS (Repetitive Transcranial Magnetic Stimulation), see our Brain Stimulation Comparison page. Made familiar to the public through a scene in the 1975 film, One Flew Over the Cuckoo’s Nest. ECT utilizes a current incredibly larger than most forms of cranial electrical stimulation (around 600-1000 milliamps), and is applied to the entire brain, often via the temples. This form of therapy usually results in a controlled grand mal seizure and must be done under general anesthesia. Because ECT produces significant side effects, including memory loss and confusion, it is only used for patients with severe, treatment-resistant depression, and even then it is used as a last result measure. To learn more about ECT, see our Brain Stimulation Comparison page. 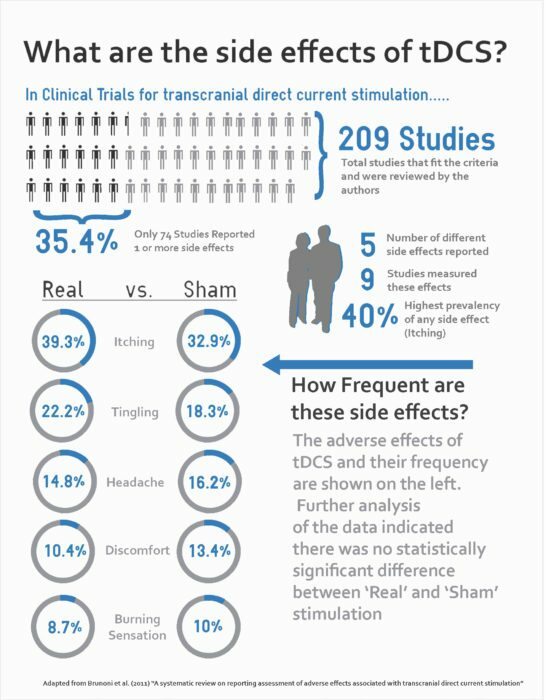 A fantastic comparison of tDCS, tACS, tRNS, and tACS from the July 2014 book, The Stimulated Brain – Cognitive Enhancement Using Non-Invasive Brain Stimulation (Page 38, Figure 2.1) edited by Roi Cohen Kadosh. What is a tDCS Device? A tDCS device, also known as a Transcranial Direct Current Stimulation device, is a small electronic “brain stimulator”. A tDCS device produces very low levels of electrical direct current, which when applied, passes transcranial – or – through the cranium stimulating nearby neurons. Unlike Deep Brain Stimulation (DBS) which involves implanting electrodes, tDCS devices work by applying current to the brain using sponge pads which are placed on the surface of the head. Check out some of our tDCS devices to learn more. What should I do while using tDCS? We design all our tDCS devices to be compact and portable, so you’re not restricted to your desk during stimulation sessions. One of the awesome things about tDCS is that it works best when used during, or just before, engaging in an activity. For example… studying, playing guitar, reading, practicing a new language, skateboarding, working out, and so much more! Submit your question here and we’ll add it to our FAQ and give you credit!